4.3 out of 5 based on 93 bloggers and 29 commenters. 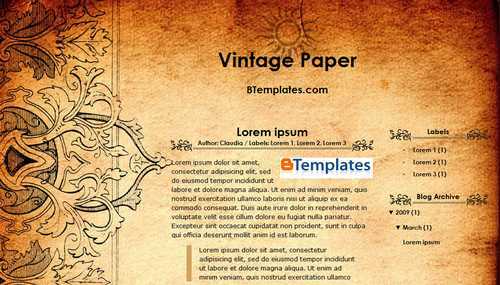 Vintage Paper is a free blogger template adapted from WordPress with 2 columns, right sidebar, grunge style and vintage style. +10 from me . . .
Is there any way to make the Date the article was published display where the “labels” are below the title? I really love this version that you did. however, I am having a super hard time extracting it. Could someone email me the XML already extracted for me? ask q lng po how pag coistumized ng blog profile? Very classy, thanks for posting! how do you add date to the listing? seems to be an important omission to not have article’s posted date. Is there a way to add the ‘profile’ bit to this template? I love this template, however, I am unable to get the code for it, as when I try to open the file after I have downloaded it, it says unknown error? If somebody could please send me the template code I would really appreciate it! it’s so cool template and it’s match with my blog. Thank you for a flawless and simple blogger template it really is beautiful and fits my storyline exactly…. is it possible to add advertisement somewhere? and how can we optimise this template for SEO? we don’t see our links as “a_page_about_books” for example. not loving this. the widget lists overlap each other and you can’t use them well…..bummer, because I really liked the look of it. I’m having the same problem! I’d really love to use this template, but I can’t get it to show up right. Everything is in one column and overlapping when I try to apply it to my blog. Disappointing. Estou usando a partir de hoje este template, maravilhoso!!!! Gostaria só de saber, se não vem mesmo a data nas postagens….Antecipadamente, agradeço.